PANAMA CITY, Dec. 3 (Xinhua) -- Chinese President Xi Jinping on Monday paid a visit to the Panama Canal and witnessed the passage of a fully-loaded Chinese container ship through the waterway's new locks. Xi and his wife, Peng Liyuan, were accompanied by Panamanian President Juan Carlos Varela and First Lady Lorena Castillo Garcia during the tour. When they arrived, Shipping Rose, a vessel of China Ocean Shipping Company (COSCO), was waiting at the first locks. The ship set off from China's port city of Qingdao on Oct. 1. Having sailed across the Pacific, passed through the Panama Canal to the Atlantic and docked at three U.S. ports, the ship is now on its return trip via the Panama Canal. The two couples waved to and were greeted by the crew members, who waved the national flags of China and Panama on the deck. In a phone call with the ship, Xi sent his greetings to the entire crew and encouraged them to make good use of the Panama Canal to optimize logistics and transportation, so as to make greater contributions to the development of China's shipping industry and the prosperity of global trade. 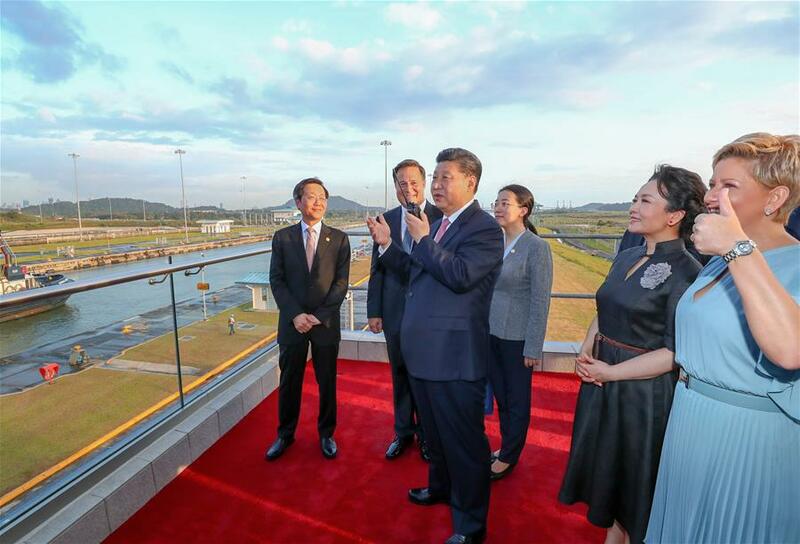 At the control tower, the two couples were briefed about the operation and management of the canal, and Varela gave Xi a detailed introduction about the canal's history, current status and future development plan. Inside the control room, Varela invited Xi to press the button on the computer to open the locks for the COSCO vessel to pass. The Panama Canal, which started operation in 1914, is an important international waterway that links the Pacific and the Atlantic. It was taken over by the Panamanian government in 1999.